The bent over row, or bent over barbell row, is an effective weight training exercise useful for gaining strength and increasing the size of back muscles. 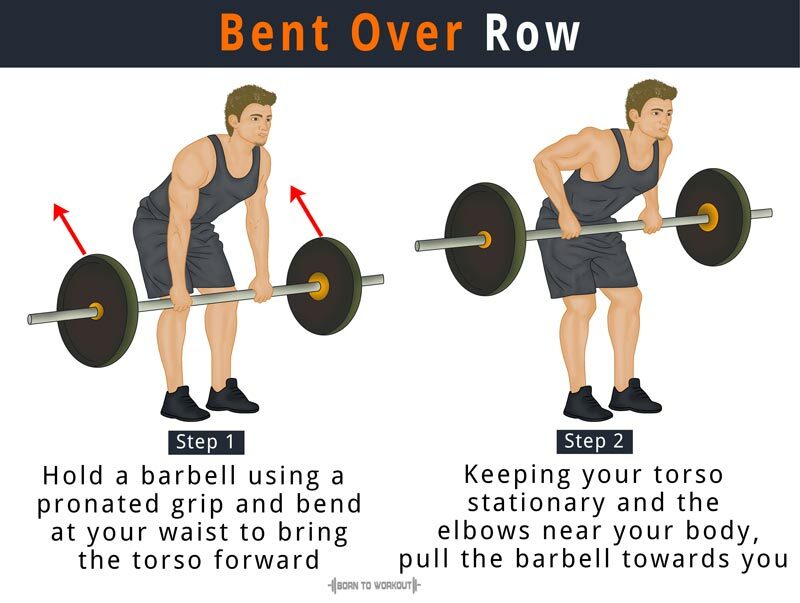 A staple for powerlifters and bodybuilders, the bent over rows are often performed as an assistance workout that can help in improving the number of reps of your deadlifts, bench presses, and squats. It is one of the best exercises for maximizing the pulling strength in your upper body. The bent over rows require you to pull explosively, which means the faster you can lift, the stronger and thicker your back muscles will get. The bent over barbell row makes you bend at the waist, thereby allowing you to execute the proper form safely. Assuming a standing position, hold a barbell using a pronated grip so that your palms are facing down. While bending your knees slightly, bend at your waist to bring the torso forward. Ensure that your back is kept straight and parallel to the ground. It is your original position. Keep your torso stationary and pull the barbell towards you. Make sure that you hold the weight by only using your forearms while keeping the elbows near your body. At the top of the movement, squeeze your back muscles and pause for a few seconds. Slowly lower the weight back to the initial position. Perform the desired number of reps.
Keep your head up throughout the exercise. Make sure that the head does not extend out forward while pulling the weight. The weight should hang in front of you while your arms hang at 90 degrees to your torso and the floor. Do not let the momentum to dictate your movements. Control the weight while performing each rep. The bent over barbell row is recommended for those with a healthy back. People affected by back problems may do the Low Pulley Row. Always ensure perfect form to keep away back injury. Do the exercise in a way so that your back does not slouch forward.